(Newser) – A year even more disastrous for elephants than it was for celebrities is ending with some great news for the species. China, by far the world's biggest market for ivory, announced Friday that it is phasing out the ivory trade and will have a complete ban in place by the end of 2017, the BBC reports. Conservation groups including the World Wildlife Federation praised the move as a historic step towards protecting elephants, which poachers have been slaughtering in huge numbers to supply the Chinese market. A 18-country "Great Elephant Census" released this year found that a third of Africa's elephants were wiped out between 2007 and 2014, with the population continuing to drop 8% a year. 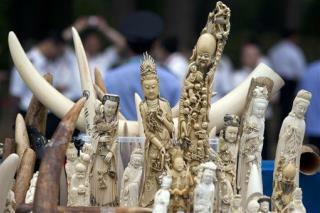 This is just the Chinese government trying to make their 'impounded' ivory worth even more. FYI, three species of big cats became extinct in Asia during the 20th Century. In two centuries, humans may be only able to view videos of some animal species that the current living generations can see in real time.